Great info to have, to be sure. Though I always wonder what the profile of business people would look like if they used the HEXACO instead of the Big Five. Or, at the very least, a measure of the Dark Triad/Tetrad + the Big Five, since the former appears to be supremely relevant to success in the business world. That and peer-rated data, so we can get honest data. I suppose versatility is the name of the game in business; this likely is the difference between me and my brother. My brother is on track for over 8A* grades including an A*-A at additional maths free standing qualification(FSMQ) at GCSE's (the average medical student at Cambridge has 7A* at GCSE's). I achieved an A* in physics, A in chemistry and 6 B's. I am now on track for A*AA at A-levels in Biology, maths and chemistry. These are grades that are generally achieved by those who get about 6-8 A*'s GCSE grades(they generally get A*A*A*) grades yet here I am. I tested my IQ with ravens progressive matrices at age 15 and achieved a score of 118(SD 15) but now it measures 133(SD15) with my brother consistently achieving 145 despite being two years younger. The average member of the population has a cognitive ability score of 5.2., a non-cognitive ability score of 5.1, and is 179.1 cm tall. 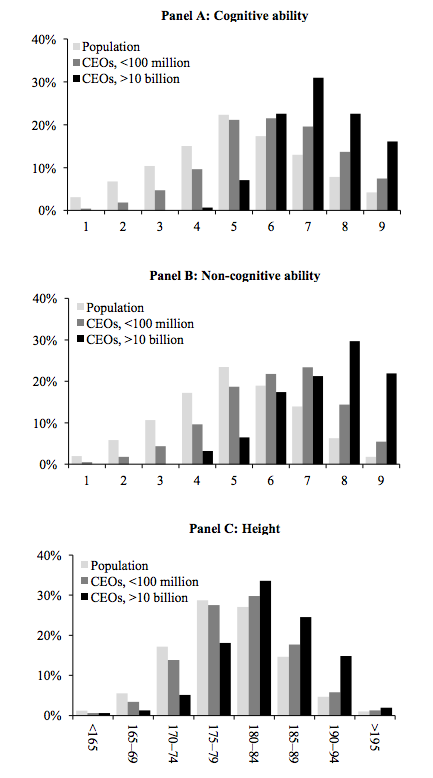 Small-company CEOs thus have about one half of a standard deviation higher cognitive and non-cognitive ability, and about one-fifth of a standard deviation higher height than the population on average. Numerically: 6.0, 6.1, and 180.2 cm, respectively. 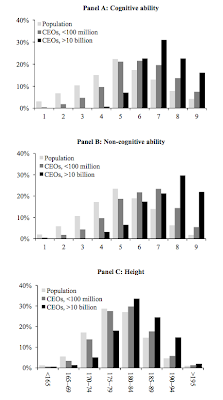 Large company CEOS averaged 7.2, 7.3, 183.2 cm (so cognitive and non-cognitive ability on average more similar at ~1.1SD than the histograms look, odd... perhaps related to the left skew in large company CEO non-cognitive ability? look at the 4 bar compared to cognitive ability). Table 1 on page 37 has descriptive statistics. Part of the discrepancy is round-off error: 7.16 vs 7.34, still more similar than the histograms appear IMHO. On page 11 there are breakdowns for percentage of each group with the top score. They note that the stanine distribution assigns the highest score to the top 4% of test takers. Seems a little low but the relative cognitive, non-cognitive and height relationships are about what I'd expect. There's some ceiling effect - 16.1% of large company CEOs hit the ceiling. If we use the standard deviations from pg. 39 then we can back out a mean large company CEO cognitive ability of 1.3 SDs from the mean (assuming normality). "The largest deviation from linearity applies for cognitive ability: in the bottom range of pay, the relationship between pay and cognitive ability is negative, not positive. We can only speculate what drives this result. One possibility is that the low-pay segment of the sample includes many small boutique-type firms (such as advisory services) whose success hinges on the expertise of their CEOs. Alternatively, it may consist of many start-up firms with excellent growth prospects but severe financial constraints on pay. Both types of firms would be expected to attract CEOs with high cognitive ability." This is not surprising at all. C-level management at start-ups (often founders) are clearly very intelligent and almost certainly more intelligent than the CEOs who end up taking over once these companies IPO and hire new management. If this study were replicated in the US, I would expect somewhat higher averages on all 3 traits. It would be very interesting to see a similar study for venture capital and private equity guys. CEOs share much in common with politicians, so we certainly don't expect them to reach the heights of intellect for most industries. Intelligence is far more important in PE and especially in VC. In terms of intellect, I'd rank the smartest CEO I've ever met at about the level of an average VC. Steve, I'm curious which areas of law you regard as rich intellectual pastures? Note I didn't write that excerpt -- I'm not an HBS grad! But I imagine he may have had IP/patent law in mind. Ah, thanks. I should've realized it was probably an excerpt from someone else because I was thinking "funny that Steve often gives anecdotes about Caltech but this is the first I've seen him mention going to HBS." I did attend Merton's class on continuous time finance (option pricing theory) and I also once dated an HBS girl. I could see their campus across the Charles from the window of my Dunster House apartment. This person is probably confusing a low correlation with a threshold effect. The reason we don't see many ultra-high IQ CEOs is the same reason we don't see many ultra-high IQ politicians. The importance of IQ in those fields is dwarfed by the importance of other traits (including height) but that doesn't magically start happening above some mysterious threshold as anyone who has ever looked at a scatter-plot can tell you. You also don't see many 6'8" CEOs but that doesn't mean height only matters up to a certain threshold, it means the importance of being tall is negated by the rarity of ultra-tall people, causing most CEOs to be tall but not exceptionally so. Since you've made up all your data, I'm not very surprised that it fits a convenient formula. Have you interested yourself in the question whether the brain size of every species triples every 4 million years? I doubt that capitalism has got much to do with it. In Scandinavia, you get into med-school straight from high-school, based on HS grades. HS grades here are on a five/six point scale where the ceiling is low. Furthermore, there is a great difference between HS schools in what it takes to get a good grade. So getting into med school here is probably a question of being very conscientious and having at least a tepid IQ (or higher), while in the US you need to do well on standardized tests. This has probably to do with standardized tests being used (or not, as here), not the economic system (i.e. _my_ hobby-horse is the explanation, not yours ;) ). Comparing against China or some similar country could probably confirm or disconfirm this. The "This" in the last sentence refers to differences in intelligence between doctors in the US and Scandinavia (dunno why Disqus won't let me emend my post). Within this section we attempted to test our first hypothesis that current memory and IQ would be lower in the homeless sample than the standardised population mean. We found that the mean WMS-III Total Memory score of the whole sample was 85.1( SD 16.2) and the mean WASI full-scale IQ score of the groupwas 84.3 ( SD 15.7). My model further predicts that decabillionaires should have IQ's around 140 and this excellent post by Steve Hsu argued that of the three richest men, all have IQ's above 135. When even the bottom third of a distribution have IQ's of 135+, a mean IQ of 140 is arguabley implied. LOL. New respect for people in bussiness and law. However, people with low V and low M are running the world from CEO, Politician (most with law degrees). What a sad world? Higher standard for US physicians reflect higher quality of US medical system. Over 90% US medical graduates pass USMLE while foreign medical graduates pass less than 50% of the same test. Try to rationalize this finding. Business and politics are about manipulation of mind of average people to buy into their ideas and products. It take one to know one. Dump people understand dump people better since they often reach the same conclusion about many things in the world. So Lower mental ability actually is advantage in the world of business and poltics since their words make sence for most average IQ people. Although your spelling is vulnerable to criticism, I think your essential point is valid. The USMLE is a joke--American medical students have to pass the first two (most important) parts before they graduate, but then have at least 4 years of residency to actually learn how to practice medicine. It's understood that the important and relevant exams are those for board certification. The lower pass rate for foreign graduates has as much to do with poor language ability as it _may_ have to do with education in home countries. Those with less than perfect English skills are seriously handicapped on an exam where one must read a computer-screen-length medical case and answer the question correctly in little over a minute. Agree--it's not so much about capitalism, but about having a meritocratic system. China had a vast and extensive system of examinations that selected for the brightest, or at least the most knowledgeable (who, everything else being equal, might tend to be smarter than those who lack knowledge and skills--the poor often had the means to obtain education in ancient China). And no one would say ancient China was capitalist. In fact, Ron Unz proposed that this system might have helped select for intelligence over many centuries. Thanks for correcting me; it seems that (at most) 1/3 of Swedes get into med-school based on a test now (dunno what it looks like). The rest based on grades or other more nebulous criteria (a fraction are even admitted based on relevant work experience at some unis). Seems like there is some affirmative action for foreigners too, even Norwegians. My source was the association for Norwegian students studying abroad. I see. My knowledge is based on MDs that have studied in Sweden, Denmark or Poland. Sorry to hear that the Norwegian has started to discriminate consciously.